We’ve been hearing reports among bidders that ghostly spirits are being spotted in various auctions across our site. Beware! In a lot of ways these Haunted Auctions work like the Free Gameplay auctions, except much scarier. If you’re brave enough to win one of these special auctions, you’ll get a Free 1X, 2X, or even 5X Gameplay! What to do if you see a Haunted Auction. First things first. These ghosts do not harm people, only auctions. So know that you’re safe as long as you stay on your side of the computer screen. 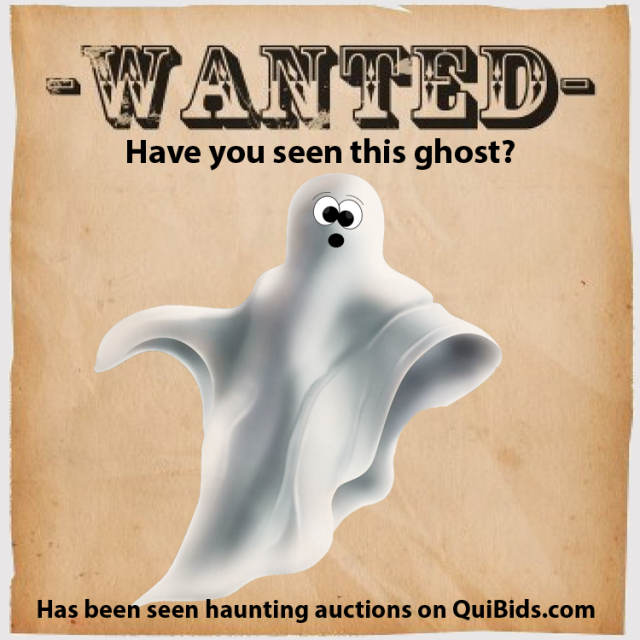 Not everyone will have the courage to stand up to the ghosts in these Haunted Auctions, so you must first decide if you have what it takes to become a Ghost QuiBuster. Are the rewards worth the risk? Haunted Auction winners get either a 1X, 2X, or 5X Gameplay. Since it’s absolutely free to place a Bid (nothing will be deducted from your account), your monetary risks are greatly reduced, which makes sense because ghosts have no real use for money anyway. Basically the only thing you’ll be spending to win one of these auctions is your time. So you’re one of the brave bidders who have decided to try their hand at a Haunted Auction? First, we admire your courage. Now you just need to know how to win one. If you remember how our Free-to-Bid Gameplay Auctions worked, Haunted Auctions behave in almost the exact same way (except for the whole spirits-haunting-auctions thing, of course). To send these apparitions back underground where they came from, you just have to be the final bidder to click the Bid button when the timer runs out, or in other words, you must win the auction. It’s also worth noting that after ten Bids, ghosts become immune to you. So you can only use ten (10) Bids per Haunted Auction. Have you seen this ghost? He’s been witnessed haunting auctions on QuiBids.com. Whether you don’t have time to read all of the jabber above, or you just scrolled down too fast, below we made an easy list of things you should know about Haunted Auctions. If you ever have additional questions, don’t hesitate to contact support or tweet us at @QuiBidsHelp. It doesn’t cost any money to place a Bid in a Haunted Auction, nor will it reduce the amount of bids in your account. So why not try these auctions out? You only have ten Bids to use in each Haunted Auction. This is to prevent the auctions going on forever with no real chance of winning. Regardless of the Ending Price when the timer hits zero, the amount will not have to be paid by the winner. So even if the auction gets up to, let’s say, $1000, the winner won’t even have to pay a penny. The winner of each Haunted Auction will get either a 1X, 2X, or 5X Gameplay that can be redeemed to play any of our games for Free Bids! It’s the least we can do for helping us bring our site back to normal! You can only win one Haunted Auction. If you win a Haunted Auction, you won’t be allowed to participate in another one. This is just to allow more bidders the opportunity to win. You must have purchased an initial bid pack. You may participate in a Haunted Auction only if you have purchased the starter bid package. If you see one of these Ghosts around QuiBids, please report it in the comments below so we can have our Ghost QuiBusting team look into it. Don’t forget to check out our other Halloween contest as well. HAPPY BIDDING!